One of the most popular home renovation projects is upgrading or finishing a basement. Great for entertaining, giving the kids a space of their own and adding a new home office or guest space, basements add a tremendous amount of living space to a home. They also present a challenge for flooring. Uneven subfloors and moisture concerns are at the top of those challenges. 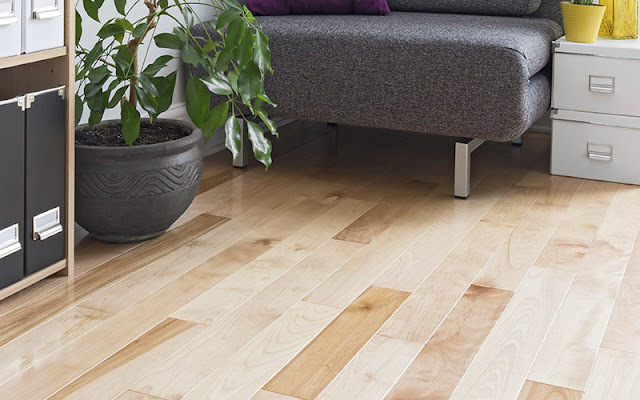 What types of floors meet those challenges while also providing the look you want? Waterproof composite tile - a type of resilient flooring - is designed with a special locking technology that keeps liquids from seeping into and under the floor. Installation requirements of waterproof composite tile are very forgiving and can easily handle the uneven, concrete subfloor often found in basements. Clearly waterproof composite flooring meets the practical needs for your basement but what about the look and feel? Waterproof composite tiles have a top layer that can be designed to mimic nearly any other type of floor. Wood, stone, ceramic, even linen or fabric are all possible styles found in waterproof composite flooring. These designs aren't like the laminate floors of years past that looked like wood until you got a little closer. These tiles present such a realistic appearance - often even with texture - that it can be hard to tell the difference! An added bonus to this top level is its extreme durability. Resilient flooring is designed to handle anything life has to offer - heavy foot traffic, roughhousing kids, active pets - and still look beautiful for years and years to come. Why choose resilient flooring for your basement project? When it's time to choose flooring for your next remodeling project, consider the benefits of resilient flooring and other hard surface floors. Hard surface flooring such as tile, wood and waterproof composite tile are gaining in popularity because of many of the benefits noted above. Learn more about hard surface flooring in our free flooring guide.